Episode One: An Interview with Dr. Stephen Price, M.D. In InService #1 Dr. Stephen Price is interviewed by Steve Koonz, M.A., M.S.W. Dr. Price is currently the owner and chief clinician at Threat Assessment & Risk Management Center, L.L.C. in upstate New York, as well as co-host of the Forensic InService podcast. Dr. Price is a board-certified psychiatrist who has many years’ experience in veteran psychiatric services, as well as general, forensic, and correctional mental health. Dr. Price has testified and interviewed offenders in numerous criminal cases including cases involving filicide and multiple homicides. Dr. Price is well-respected by prosecutors and defense attorneys and has enjoyed a long and distinguished career. During this episode, Dr. Price discusses his career in psychiatry and forensic mental health. 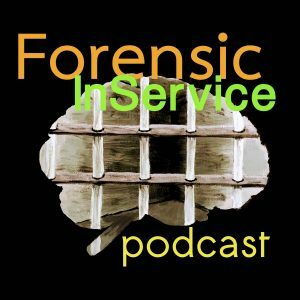 He discusses his role in criminal cases, in terms of educating the court, and the primary areas of importance in psychiatry with respects to forensic and correctional mental health practice. Dr. Price elaborates on this in a conversation about how he prepares in the role of expert witness. As a bonus, Dr. Price discusses the role and benefits of telepsychiatry in correctional mental health, issues related to reentry, and the future of forensic psychiatry. The Forensic InService podcast (copyright © 2018) is created and produced by Stephen Koonz, M.A., M.S.W. & Stephen Price, M.D. Please visit Forensic InService for further information about the show or to hear other episodes. Our artwork was hand painted by Jennifer A. Koonz and used with her permission. Our music was created by Adam Price and used with his permission. Any use of any part of this episode, including the music or artwork without the creator’s or this show’s permission is a violation of copyright.